The Oregon Ducks Football team received a welcome shot in the arm with the recent addition of junior college transfer Malik Young, who comes from Eastern Arizona College in Thatcher, Arizona. He grew up and played high school football in Marietta, Georgia, graduating in 2013. Young committed to West Georgia Tech out of high school, but the school dropped the sport before he even enrolled. He took time off and worked during 2014 and surfaced at EAC for the 2015-2016 academic year, playing football for the Gila Monsters. A successful two-year stint in Arizona followed where he accumulated 111 tackles and four quarterback sacks, resulting in Defensive Player of the Year (2016) and First Team NJCAA All-American (2016) honors. He signed with Missouri in February 2017 as a cornerstone of their recruiting class, but subsequently was denied entry due to SEC transfer rules and eligibility clock issues. A whirlwind visit to the University of Oregon ensued, and Malik Young committed and enrolled August 25, 2017. Malik Young has been listed by most media sources as 6’2 tall. He has been reported to be between 280 lbs. to 301 lbs., depending on the reporting source. The ESPN claimed he was 6’3 280 lbs. on his commitment to Missouri. However, the consensus seems to be that he is 6’2 and 301 lbs. as multiple sources are reporting. Among them Comcast Sports Network (Northwest) and The Register-Guard. I have not seen any reported information on him about his hand size, however a prospect of his dimensions would most certainly have average to an above-average span (9-1/2″ to 10’0). Though I have not seen any information on him attending officially sanctioned camps where triangle numbers have been verified, I would not be shocked if he ran the 40-yard dash in under five seconds. His HUDL video profile lists a 4.85 clock, however [again] this is unverified. My guess that he is capable of running under a 5-second 40 is based solely on tape and I have no way to verify it, however his speed and agility for his size is impressive. This threshold (five seconds) separates the elite “Big men” from the average players that man the defensive tackle or defensive end position. Malik Young has the build that is probably best suited as a three-technique defensive tackle in a 4-3 scheme. Though he is an inch or two shorter than ideal, he probably projects as a defensive end in a 3-4 scheme. He is very athletic and does a nice job of pushing the pile in a bull-rush, splits double-teams and understands leverage. In fact, his tapes demonstrate this leverage where his short stature comes into play. Unblocked, he explodes off the line of scrimmage in the clip above. He demonstrates a nice forward lean and is a formidable edge rusher if the offensive tackle does not get a good hand punch in to slow him down. In the clip above, Malik Young demonstrates why the “low man wins.” If the offensive lineman across from him is not a natural “knee bender,” he will lose this battle every time. Watch Young turn sideways to get “skinny” in the clip above. Even though his inside pass rush is not perfect (he could play lower), it’s good enough to split the double-team. This guy is a wrecking ball. Watch him blow up the whole play in the video above. Great closing speed and strength to collapse the pocket are the hallmarks of a solid inside pass rusher (he is lined up as a nose tackle). A guy like this will force a quarterback off his mark and disrupt the timing of the play. Pretty impressive. In the video above, Young “ragdolls” the center, and rocks him back on his heels into the backfield. This disruption of the blocking schemes create creases that linebackers can exploit by shooting the gap and making plays behind the line of scrimmage. This is the foundation of great defense-making plays on the opposing side of the line of scrimmage. Watch Young bull-rush his opponent and leverage him off his spot, then do a nice spin move to make the tackle. Very impressive. A great swim move combined with an elite first step is a nightmare scenario for an offensive lineman. Watch Young make it look easy in the video above. 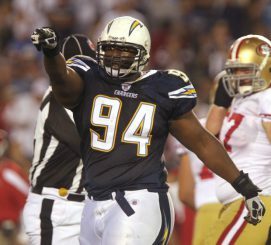 Corey Liuget of the Los Angeles Chargers who was taken by the Tampa Bay Buccaneers in the first round of the 2011 draft (No. 18). Malik Young is very similar in build and athleticism to the wrecking ball that plays for the Bolts. Other players in the NFL that Young is similar to: Mike Daniels of the Green Bay Packers taken in the fourth round (No. 132), Kyle Williams finishing a stellar 12-year career with the Buffalo Bills drafted in 2006 (fifth round-No. 134), and John Hughes of the Tampa Bay Buccaneers who was drafted by the Cleveland Browns No. 87 overall in the 2012 draft (third round). Malik Young has the potential to be a very good NFL defensive end. He combines nice size and core strength with above average athleticism. His first step at the snap of the ball, and penetration are elite. He uses his leverage and long arms to make plays in the backfield even when he is NOT in the running lane. His film clips are full of him making ankle tackles for loss, even though the ball carrier is attacking a different lane away from what Young’s responsibility is. He demonstrates a powerful bull-rush and does a nice job of splitting double-teams. There is very little tape of his pass rush from the outside as you would expect, because he lined up primarily on the inside in both high school and junior college. However his inside pass rush is excellent due to his relatively short stature and his natural leverage against taller offensive linemen. This guy is a wrecking ball. He blows up plays and disrupts the offensive line blocking schemes creating chaos. It is unknown at this time whether he will play more than one year at Oregon. However with a solid year (as I suspect he will have) I would not be shocked if he was a “one and done” guy. Based upon the film I have seen, he would probably earn a fourth-round grade in the upcoming draft, and with a dominant year in the Pac-12, he could go as high as to slip into the bottom half of the second round.